1950 Edo Wazao Pole Unfished. The Other Traditional Rods forum. Re: 1950 Edo Wazao Pole Unfished. Would love to see some action shots of it in action. nothing as grand as this. A little work of art it looks so tactile and begs to be used. I noticed that the cloth/paper? cover inside has a Perch? and a old Mitchell 300 type reel drawn on it, anything else interesting on there? This is what came in the box. 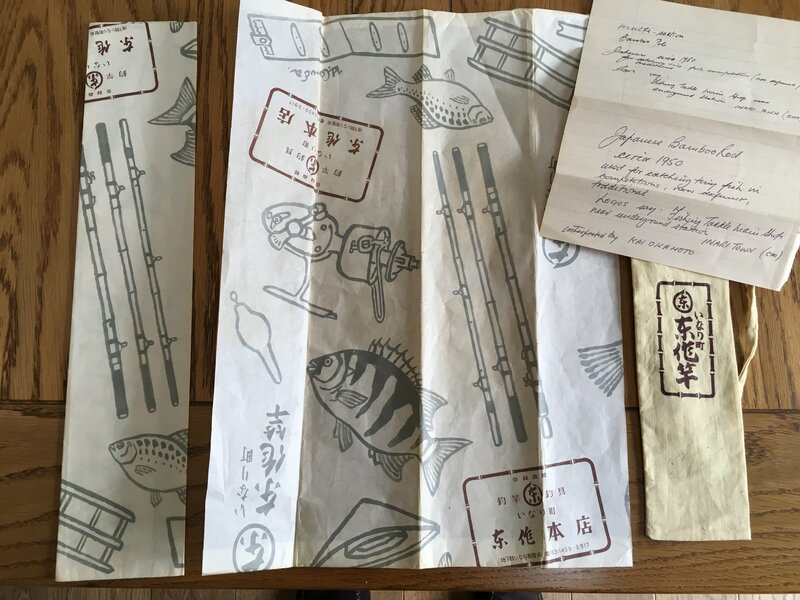 There are 2 of the paper wrappings, a dedicated cloth bag and a letter with an interpretation of the lettering on the pole and paper wraps. Interesting to note that the reel is showing a full bale arm. A wondrous thing indeed, there must be many more of these treasures stashed away. Eyes peeled now. I wish there were! The only markets seem to be Japan & USA - unfortunately. They are available new at a price - an expensive one!